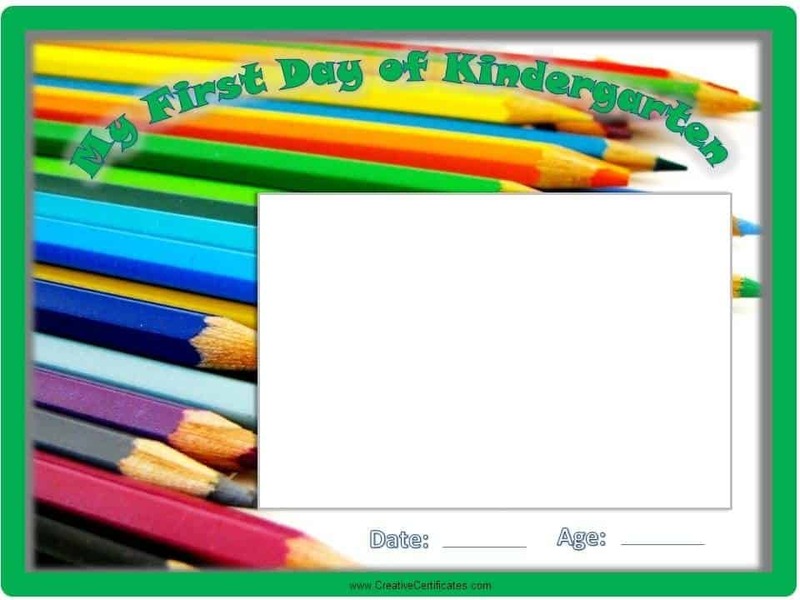 Create a certificate for your child on the first day of school to remember the occasion. Add a photo from the special day. You can either create the printable online by uploading a digital photo or print the award and paste a standard sized photo. If you want to give your students a reminder of this special day you can bring a camera to class and take a photo of each child or a class photo. Print a copy for each child, paste the photo and give them the gift. They will definitely appreciate the effort. The first day of school is so exciting! My son is starting school next week and he has been walking around the house with his school bag all week! When my oldest child started school we were excited as well but I don’t remember the day as clearly as I thought I would. 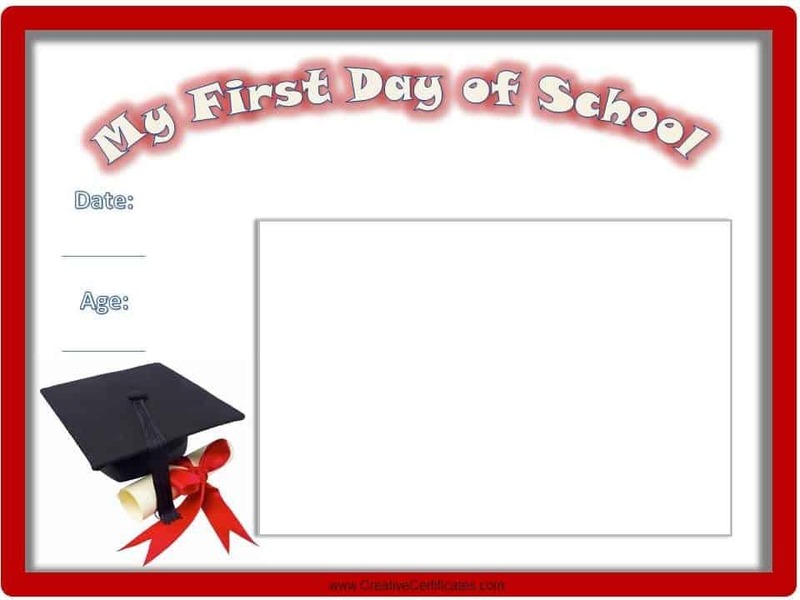 If I hadn’t prepared a certificate for the first day of school I might not remember that day at all, what he wore, the expression on his face and his excitement. OK, I admit that the reason that I remember every detail is from looking at the photo and not from the certificate BUT if I hadn’t prepared a certificate I wouldn’t have had the photo printed! I take thousands of photos but usually don’t bother to get them printed. Making a certificate for your child to record the first take of school will ensure that both you and your child remember this special day! Bring a camera to school on the first day and either take a photo of each child or a group photo with all kids. Print a certificate for each kid (either this one or any other appropriate one) and add a photo to each one. It will make an awesome gift for each child to remember this special day and importance milestone in their lives. Why not take a digital camera to preschool on the first day and take a photo of each child or a class photo with all of the kids. 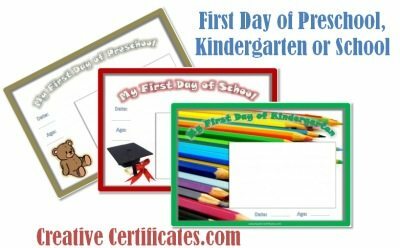 Get one copy printed for each child and paste a photo on each certificate. This will make a great gift and is an excellent way to start the new year! Don’t forget to record this and all other special moments and milestones. 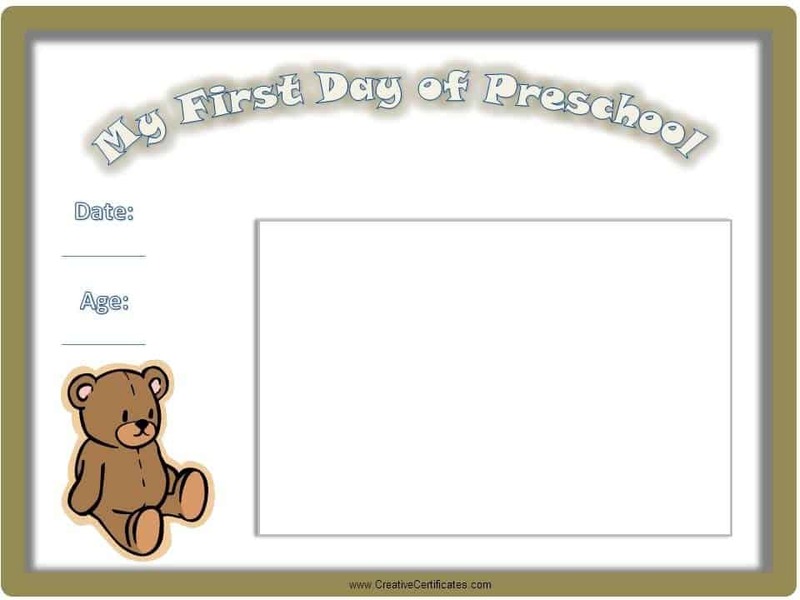 Print a certificate for each one and have them bound to make a baby book when complete. There are many more milestone certificates on this site for all of the major milestones your child reaches!